In today’s final round of Group F matches, we’ll see Nigeria take on Argentina. The two teams are the top ranked in their group—Argentina has six points, while Nigeria has four. It’s likely that these two teams will move onto the next round, so it should be an exciting match. The only thing standing in the way for Nigeria is if they lost to Argentina, and Iran beats Bosnia and Herzegovina in the match taking place at the same time over in Salvador’s Arena Fonte Nova. The setting for the Nigeria vs. Argentina game is Porto Algere’s Estadio Beira-Rio, and we’ll be ready to watch some top-class football when the match kicks off at noon Eastern. In the meantime, we’ll concentrate on the matter at hand—the World Cup of Cars: Nigeria vs. Argentina. Playing for Nigeria is the Nissan NP300 Navara. This pickup truck was recently revealed, and is rumored to be the base for the next-generation American Nissan Frontier. Nissan is an important part of Nigeria’s economy right now, with the Japanese company investing heavily in Nigerian plants, and the country hoping that this will start a boom in automotive manufacturing. But enough background—onto the vehicle itself. So far, Nissan has revealed two engines to be featured in the NP300 Navara. Both are 2.5-liter 4-cylinder motors, but one is gasoline and the other is diesel. Each engine is powered by either a six-speed manual or seven-speed automatic transmission. Additionally, the NP300 Navara is powered by a shift-on-the-fly four-wheel drive system, with the possibility of a two-wheel drive model becoming available. From a looks standpoint, the truck gets a similar, updated version of the Frontier’s grille and headlamps. Additional features include Nissan’s Vehicle Dynamic Control system, Hill Start Assist, Hill Descent Control, and Active Brake Limited Slip. On a final note, the available images show the NP300 in a orange-yellow-gold color that looks pretty damn cool. On the opposite side of the field is the Ford Ranger, representing Argentina. The Ranger isn’t made in the South American country, but it is popular there. While the Ford Ranger isn’t sold in the US any more, it’s still pretty big in Ford’s overseas markets. 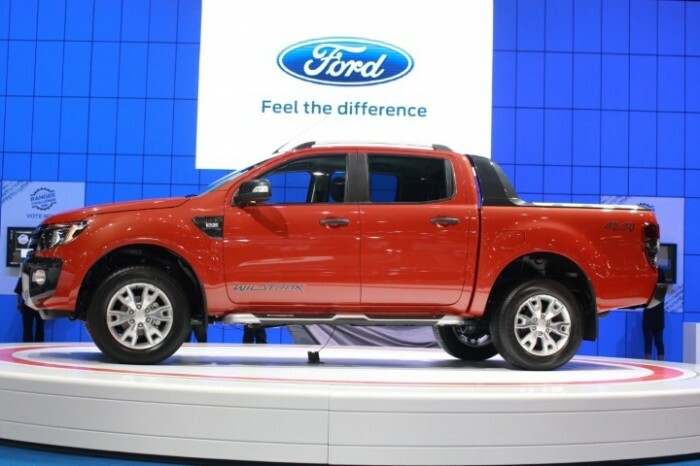 In fact, while Ford dropped the compact pickup from its US lineup in 2011, an all-new Ranger debuted at the Sydney auto show in Australia around the same time. The redesigned Ranger features three engine choices, including a 2.5-liter petrol, 2.5-liter diesel, and 3.2 liter diesel. Inside, the Ranger features 20 built-in storage spaces, dual-zone climate control, a mini cooler in the center console, and Bluetooth connection. The current Ranger is close in size to the Ford F-150, which was a major contributor in Ford’s decision to discontinue the truck in North America, but at least this gives us a good idea of what the Ranger looks and feels like. When these two trucks meet on the field to battle it out for the winning spot, sparks are sure to fly. Both offer what you’d want from a pickup truck—utility, comfort, affordability. But there can only be one winner, and today we choose the Nissan NP300. Mainly because we like the cool color. Such is life. Congrats, Nigeria! Tune into Nigeria vs. Argentina today at 12 noon Eastern on ESPN.